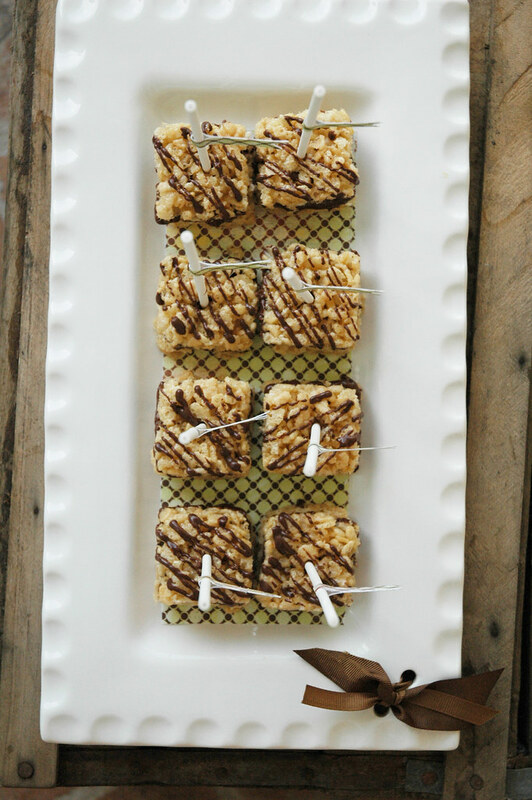 i was asked to bring rice krispy treats to a gathering of friends this past weekend. 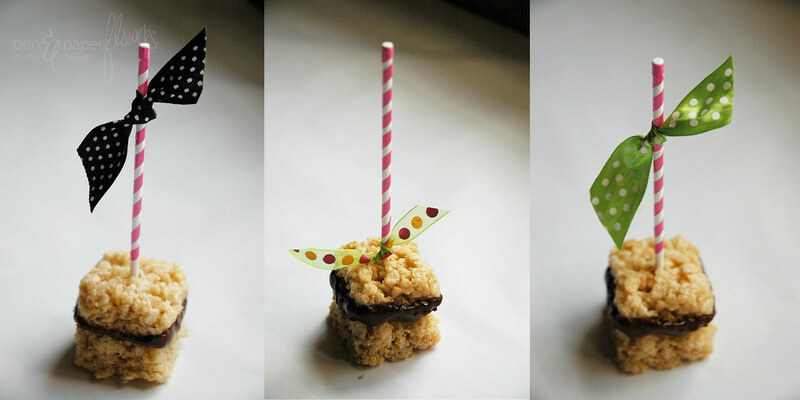 i made a regular version of rice krispy treats with NO lollipop stick - for the gentler crowd. i decided to sandwich two rice krispies together so that the chocolate wouldn't actually touch the tray/plate they were going to be displayed on. less mess is always better, right? & a coordinating flag to the lollipop stick. VERY cute presentation don't you think? this is SUCH an easy dessert ANYONE can make. SUPER EASY ways to help doll them up. 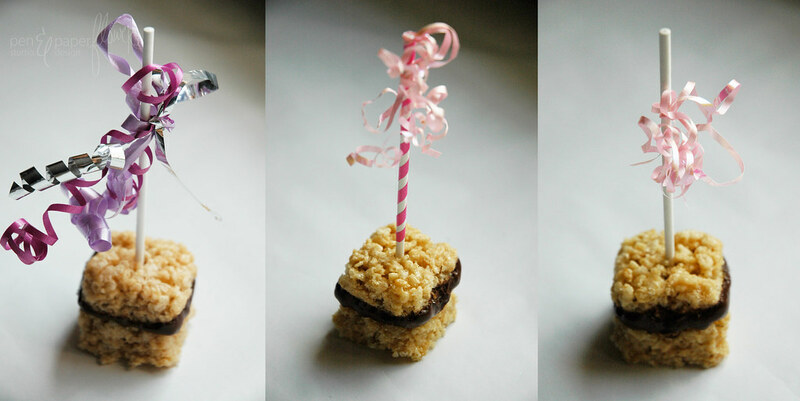 "rice krispy treat fancification experiment"! think little girl birthday party, baby or bridal shower and how about a "circus" or "vintage" themed event?? what about pink & black...or pink & green WITH or WITHOUT the striped lollipop stick? lollipop stick gives such dramatic results...don't you agree? i just removed the middle insert of the flower on the first example - punched a slightly wider hole with my "crop-a-dile II" and slid it right onto the stick. perfect fit. (these "celebration circles" are part of my "Caitlyn Cupcake Collection" found in my shoppe). tulle on the top or tulle on the bottom? totally makes me WANT to have a raffle at my next party!! 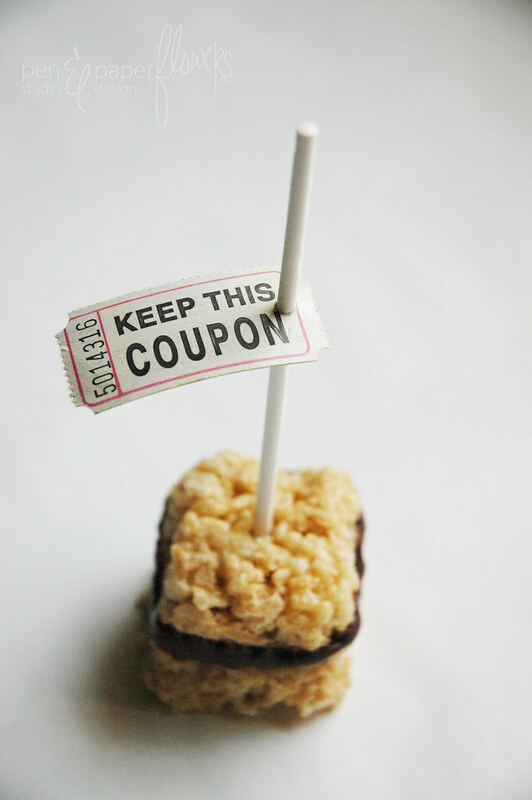 think carnival/circus party or a raffle at your next bake sale...clever! but it doesn't have to be complicated. remember that for your next party!! Wanna hear something SO funny? This "photo shoot" was done 3 days after I made them. Needless to say the chocolate lacked that "fresh" look. It needed some "just dipped shine". I grabbed the olive oil, dabbed some on my finger & rubbed the chocolate to spruce it up. Anything for a photo shoot, right? You are so creative-and must have a lot of patience!! I would have quit after the first bow. I'm going to try these with my grandchildren. Thanks! 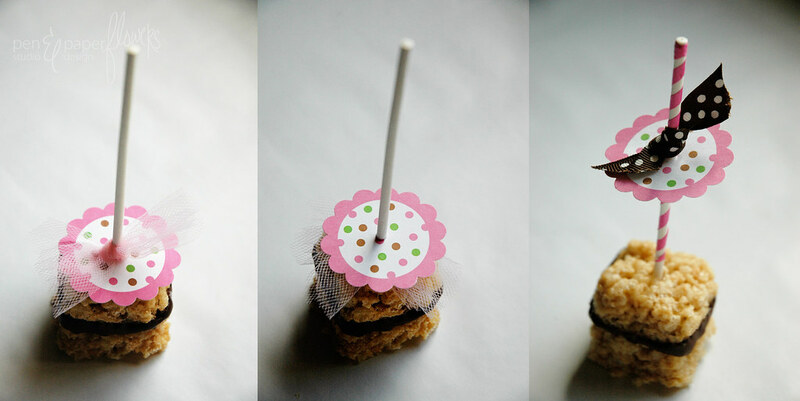 Even though these treats are simple to make, I love your idea of fancying them up! I hope you don't mind if I copy some of these ideas in the future. Thanks for sharing! Donna...I absolutely WANT you to copy these ideas! Feel free. My goal is always to inspire others to try the things/ideas I share here!! Thanks for commenting and I do hope you'll share your creations!! Hugs! They just might be the fiercest cereal treats this side of Buddy Valastro. 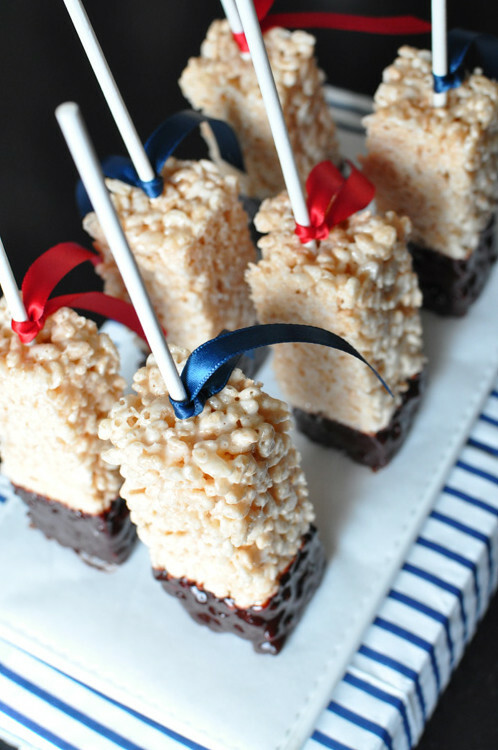 Never saw such gorgeous rice crispy treats~ EVER! awesome! I love all the styling! The sandwich chocolate idea is genius! love love! Super cute ideas!! 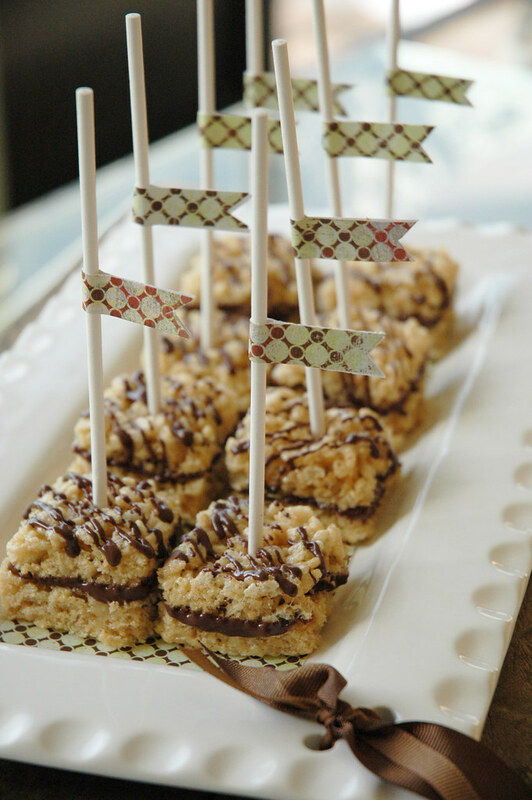 Rice krispy treats are so yummy, why not make them pretty, too!? Such great ideas! Thank you for sharing!! they are all so gorgeous! Love the one with the ticket :) Tons of possibilities with such a simple treat!! Very impressive! I am going to have to try that out. So cute! WOW! Just found your blog and this post! SO cute! I will totally try these and if I use them for my daughter's party, I will be sure to link you on my blog. Awesome! Adorable! Thank you for the inspiration! i LOVE the idea...especially the ones with the flowers on the sticks, since i AM having a garden tea party for my babes first birthday party! Just perfect... easy, sweet, and cute! This is such an easy and fun idea! Great idea! How long do these keep for? How do u store them?